The acceleration, the speed and the thrill are what you love about driving your luxury European automobile. But, the performance driving you have come to expect can suffer when your vehicle experiences fuel injection issues. Carbon build-up in your fuel injection system can cause poor gas mileage, knocking noises, rough idling and hesitation with acceleration. If you are experiencing poor performance from your luxury import car from dirty fuel injectors, they must be cleaned to prevent damage to the point of failure. 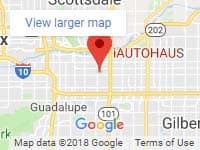 The ASE Certified technicians at iAUTOHAUS in Tempe, Arizona provide fuel injection service and repair for BMW, Audi, MINI, Mercedes-Benz, Volkswagen, Jaguar, Porsche, Maserati, and other European models. When you choose a BOSCH Authorized Service Center, you can expect that you get the best possible service and the proper parts for your cherished import. The professional technicians at iAUTOHAUS have proudly served Gilbert, Chandler, Queen Creek, Phoenix and surrounding areas since 1997. Apply for BOSCH auto repair financing. Schedule a fuel injector service in Arizona with iAUTOHAUS today! Electronic fuel injector systems are a great advance from older carburetor systems. The fuel injection system works by delivering a mixture of oxygen and fuel to the engine. The mixture combusts when the spark plugs activate, providing power to drive your car. Problems can occur when the fuel injectors become dirty, from poor fuel quality or spirited driving habits. The certified ASE technicians at iAUTOHAUS will perform diagnostics that are manufacturer-specific for your import vehicle. We will determine the source of the problem and provide quality, cost-effective service or repairs for your fuel injection system. We are committed to helping you keep your luxury auto running at top performance. If you are experiencing any of these problems, you need professional help. Contact iAUTOHAUS in Arizona to keep you and your passengers safe and prevent irreversible engine damage. iAUTOHAUS proudly serves local customers in the state of Arizona. Our multicultural staff can assist you in Spanish, Vietnamese, Polish, German, Russian and Hungarian. BBB accredited, iAUTOHAUS is also certified by DealerRater and is recognized by Ranking Arizona as one of the ‘Top Ten Car Dealers in Specialized Autos‘.